The other day on the way home from work I spotted this plant sitting in the street in front of someone's house. "Stop the car! Get that plant!" I yelled to D. The three kids in the backseat asked, "what? what mom?" D was like..."are you serious?" I was most definitely serious. Heck, many many years ago we outfitted most of my apartment by diving into people's garbage after hours. So, we have matured over the years because D actually went and knocked on the door to ask permission. Nobody was home. We took the plant. These aren't the best pictures but you can probably tell that it is a rubber tree. It was in desperate need of water so I watered it. It also needed to be put back into its pot. Whoever threw it to the curb did so in a way that the pot was laying next to the tree. I also plan to replace the metal pipe to a wooden stake. I have plenty of brush on the back hill I can use. So, what would you have done? Would you have stopped to save a plant? Do people keep rubber trees as in-door plants or out-door plants? For some reason I am under the impression that they are often kept inside. yes "lost" they are kept as in-door plants....but i from what i see in the picture the pot is pretty beat up and cracked, thats probably the reason for its current outside venue. what a great find here.forward. right place at the right time i guess. how did you get it into your car? it looks pretty big. 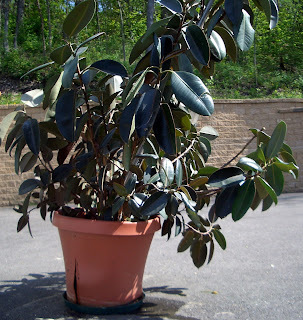 I thought for a second that you had yourself a big honkin' magnolia in a pot. To me, they look pretty similar. Too bad for your tulip, though, that all it gets is a rubber tree, but still nice to see your lanscaping as it progresses. Wow! Holy comments...thanks for visiting! 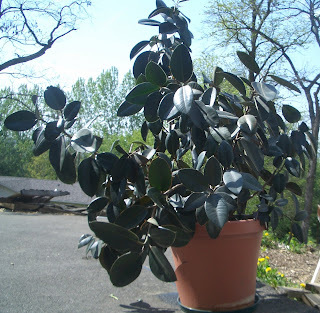 Perdido- I have two rubber trees that I have always been kept indoors. My brother has been successful taking his tree outside in the summer. I'm not sure what I will do with it. dc nick- great question...actually my husband called a friend to pick it up in his truck and deliver it to us! Anon- I WISH it was a magnolia tree...a little too cold in my part of the world for that though. That's awesome - I LOVE rubber trees! I'd have picked it up & then tried to figure out how to get it in & out of my little beetle - LOL.